Here we will cover some suggestions for a Family Fitness Plan - with ideas and tips for ways to improve your family relationships with fitness and fun activities outside and around the home. The Family Who Plays Together, Stays Together! The decision to start a family is one of the most important a couple or single person will make. It’s a decision that will last a lifetime. When anyone commits to starting a family the responsibilities of running a household now turn into the added responsibility of bringing a life into the world, or lives, depending on the number of children, and raising that offspring from infancy to young adulthood. It’s every couple or single person’s wish that their children grow up to become responsible adults who may one day start families of their own, and the circle of life continues to evolve. But, let’s face it, some couples or single parents have proven better at the task than others when it comes to raising their children. The phrase “dysfunctional family” is one that’s tossed around quite often. It’s derogatory and certainly not a phrase anyone wants to hear to describe their family, so, what’s the secret to keeping the family functional versus dysfunctional. It’s often as simple as proper bonding, unity and open lines of communication. A large part of nurturing is instinctual. From the time a couple or a single parent brings a child into the world, there is a natural instinct to give this new addition the basics: shelter, food clothing and love. Sounds easy enough, and at first it might be, but, then children grow older. Their basic needs are still being met but they’re no longer infants. They’re older, they understand more, they have their own personalities and are able to do more, including, make their own decisions. They’ve made friends. They’ve joined school groups. They have schedules and moms and dads have their busy schedules too. Base necessities still have to be provided, but as children grow the nuclear dynamic takes on a different picture. This may be when the family starts to lose some of that closeness they shared in the early infant and toddler years. But, it is exactly at this point that parents need to be proactive in keeping a close knit relationship with their sons and daughters, and to instill a deep trust with open lines of communication that are often facilitated by that trust and closeness. It’s also a perfect time for heads of the household to remind their progeny that regardless how busy everyone is “we’re still a family” so let’s spend quality time together, and also make it worthwhile for your health through physical activity. · Physical activity?? Exercise?? Yes exercise. Exercise promotes good health, prevents obesity and instills good habits in kids that can follow them into adulthood and is the ideal way for families to remain close. · It’s not always easy to get in time for exercise, or to actually do it, but, if you do it as a family, it can turn a mundane chore into a great time and also support those fragile and very important family relations. · Doing instead of saying and teaching by example is the best way to instill in kids anything you want them to learn in life. And, you as a parent, telling your kids to go out and get some physical activity while you watch TV during your down time, will never make the same impact as grabbing a basketball and organizing a family game. Teaching by example, and the “do as I do” instead of the “do as I say” approach works every time. And it instills a feeling of respect from kids towards their parents as well. · Physical activity is a great time to bond, and play together. Bonding as a family, especially in the busy times we live in is essential as that closeness will serve you in many other ways as children get older and encounter the typical problems of adolescence and the teen years. 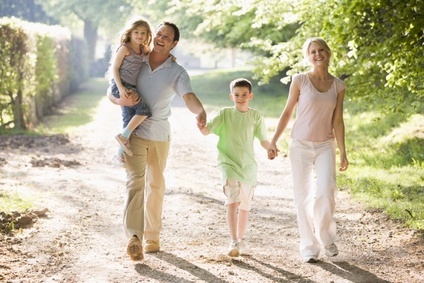 · Another way that family fitness serves is that while hiking or walking, for example, you have the opportunity to talk, and to open and reinforce those all-important lines of communication between yourself and your kids. · As opposed to watching television or playing video games, physical activities are much more social in nature, allowing for the family members to interact with each other in a much more direct way. · Building positive memories that children will treasure into adulthood is yet another great benefit of engaging the entire family in exercise. Those moments where everyone is happy, laughing and enjoying a good time are the ones we always remember most as we look back on our childhoods. Household chores, such a, cleaning, gardening, and yard upkeep are all viable physical activities that include movement, and they are all tasks that need to be done. It’s not always something that adults want to do, let alone kids, but, if parents ask instead of insist and then join in and help it can make the accomplishment less of a hassle and everyone in the end is happy with the outcome. The reality is mom or dad is not going to be around forever to help out with the chores, so here is another opportunity to bond with your son or daughter while at the same time teaching lessons on the importance of keeping a home clean or a yard manicured. · Fun obstacle courses set up in the backyard. · Pack a picnic and go to a park, hike around, and then find a picnic bench to sit down and share a meal together and just talk. 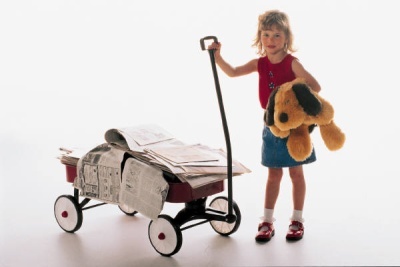 · Home remodeling tasks (as they are age appropriate for kids). 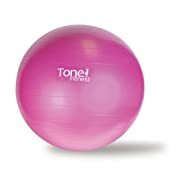 · Outdoor games, all sorts of which can be found at your local sporting goods store. · Timed treasure hunts will get everyone moving in a race to find the prizes. · Mini trampolines offer a great workout, both cardio and muscle toning. · Outdoor cement chalk games, where jumping and hopping are the main elements. Calisthenics and using workout DVDs, such as the Fitness Kid workout DVD program that is made especially for kids and teens, and works great for parents is a great option to workout inside the house. There are also various fitness based video games that can be done together using the Wii Fit gaming system. Not only is the family spending time together, they’re exercising, and because this is a “gaming” system, there is bound to be plenty of fun and laughter, which promotes bonding and quality time spent with the people who mean the most to each other, the family, which is one group that should always remain close. Another activity that ties bonding with health for the entire family is healthy cooking and doing it together. Most kids love to help out and do “adult” things, and cooking is one of the most rewarding because it can involve the whole family. It is of utmost importance to educate children on eating a healthy diet and that includes preparing food in a healthy manner. There are so many ways that kids can help out in the kitchen, and while you must be age appropriate in the tasks that you assign, even the youngest of kids can tear lettuce, and help set the table. · Bonding and quality time spent together. 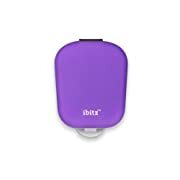 · Provides opportunity to talk and interact with family members. 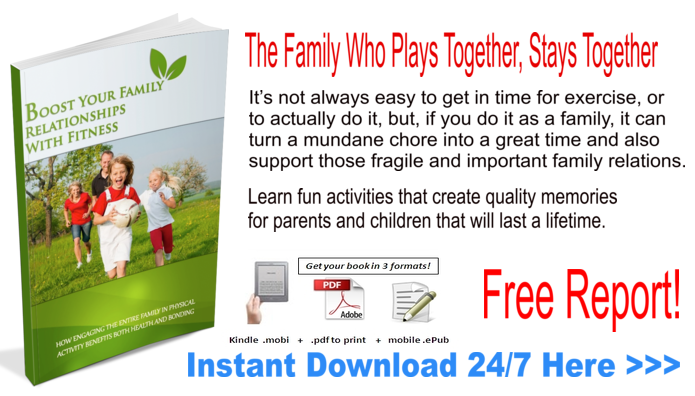 · It’s fun and creates quality memories for parents and children that will last a lifetime. · Educating kids about healthy ingredients. · Teaching kids to eat healthy. 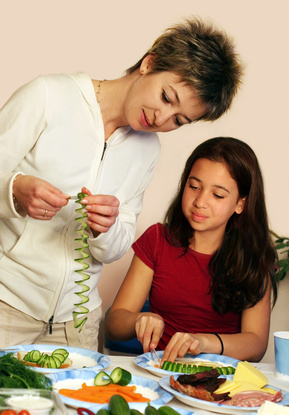 · Teaching kids to cook healthy and the proper methods to use. There are a lot of great activities that can be created around healthy cooking that the whole family can take part in, and what a great bonding, quality time opportunity it provides! · Go shopping together! This is a great opportunity to educate kids about choosing healthy ingredients to place in their cart. Use this opportunity to point out food labels to older kids and teach them what each line means. · Have each member of the family choose a healthy ingredient for family dinner cook offs. · Plan menus together 1 or 2 weeks at a time, use an arts and crafts approach to create a final piece that will hang on the fridge. · Older children and even young kids through the use of photos can help choose various dishes from a healthy cooking book. Another “together time” activity that the whole family can have fun with. · Plan a weekly weekend barbecue and weave in fitness by first playing some type of sports or a relay race, followed by a healthy cookout lunch. 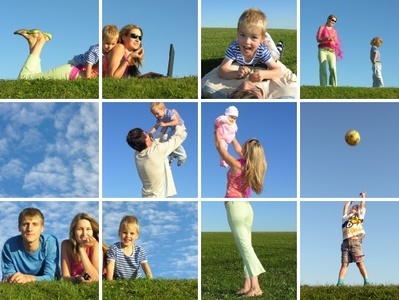 The side effect of the above is that it creates the added benefit of the family eating together, which, allows for more quality time and is important to plan for because as children grow older and their schedules and activities become more involved something as obvious as finding time to dine together can become a challenge. This is why as heads of household you should strive to find time regardless how old the children are to make it a priority to set a time when everyone comes together for a meal, as well as, the rest of the above. If you instill these values when children are young and do it in a way to involve all family members and have some fun at the same time, even chores, your children will do the same with their own families when the time comes. Plus, as a family unit, you’re exercising, staying fit and healthy together as you all grow older. Physical activity is a great time to bond, and play together. Bonding as a family, especially in the busy times we live in is essential as that closeness will serve you in many other ways as children get older and encounter the typical problems of adolescence and the teen years. To recap, let’s reiterate the above. Family time is a necessary part of growing and nurturing a family unit that is healthy on the inside as well as the outside. There are many great ways that families can engage in fitness together and really with a little creativity you can come up with many more. 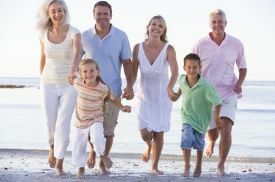 People come and go, but, the family unit is from now until the end of life, so that unit should be preserved, so it’s a great idea to begin when the children are young to instill in them the importance of family and enduring together through the many years. And, all of the above makes staying fit and healthy fun, instead of a chore as it is often portrayed. If you liked this guide you may like to download it for future reference. No subscription or registration required, just click below to visit the download page at Box.com and grab your report in three reader formats to suit all your reader gadgets! Back to HOME PAGE of this family fitness plan section of the site.